The Philippines is a nation blessed with 7,107 picturesque islands and visiting all of them would probably take a lifetime. But with Nayong Pilipino sa Clark, you are given a taste of each region’s best. Situated in the old Expo Pilipino complex in Clark Philippines, the 45-acre park contains replicas of famous edifices of the pre-colonial and colonial eras of Philippine history. Marvel at their depiction of “Malakas at Maganda”- an ancient story that narrates the creation of Filipinos and take a peek into the lives of the Cordillerans of Northern Luzon through the Ifugao and Kalinga Villages. 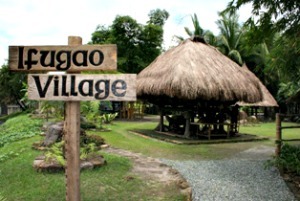 Other cultural minorities such as the Aetas of Central Luzon likewise have a village inside the park. Also, see the newly-built Torogan which is an ancestral home of the Sultans and Datus in Mindanao. It has a butterfly-like end beams that protrude in front of the house and is intricately adorned with a range of folk motifs usually a plant, geometric form, dragon or a serpent that are prominent in Maranao artwork. The building is constructed on post resting on rocks which act as rollers to prevent earthquake damage. Visayas Island is represented in the park via the Chocolate Hills of Bohol and Magellan’s Cross of Cebu. The centerpiece of Nayong Pilipino is a Spanish-inspired colonial plaza area that was modeled from the old promenade in Vigan, Ilocos Sur. It features the replicas of the most important structures during the Philippine Revolution namely the house of National Hero Jose Rizal in Calamba, Laguna; Apolinario Mabini’s house in Manila; Emilio Aguinaldo’s house in Kawit, Cavite where Independence was proclaimed in 1898 and the Barasoain Church where the inaugural constitution was drafted. A mass is held every Sunday inside Barasoain. Apart from the edifices, be amazed with the cultural numbers of Nayong Pilipino’s resident arts group. A fee of P30 is charged for kids and P50 for adults. The park is open everyday from 8AM to 6PM.